When profit motives dominate and quality of education is sacrificed or fees and other charges levied in excess of expenditure on services provided such educational ventures are generally termed as private coaching. The impact of education is intense and pervasive on almost all human activities. In professional and personal development of people education and training are an essentiality for ensuring their social progress and economic growth. In economic sense, investment in education is profitable. Parents of successive generations have, therefore, been concerned about the level and quality of schooling of their children. The private coaching institutions exploit the prevailing excessive demand for education and operate with profit motives and they charge high fees. The reasons for demand can be two-fold: the inability of the government to provide education to all those who need or desire it; and the inability of government agencies to provide education of quality perceived to be worthwhile. . It is here that coaching institutions find a fertile ground for undertaking their activities on a commercial basis. In general, coaching institutions of education is not accepted and approved by the society, particularly by the countries like India, which have a democratic polity. But , inequality of opportunities and provisions for educational services contribute to inter-personal, inter-regional and inter-generational disparities of all forms. These perpetuate socio-economic disparities and hamper national development. Moreover, India’s long history, tradition and culture of imparting knowledge and training have put pious obligations on the duty conscious society for providing worthwhile education. The socio-economic benefits over the entire span of working life accrue more to educated and trained persons and therefore, attempts are made by students and their parents to obtain good education at even high private costs. The demand for various types and levels of courses is much higher than available places/seats for learning in creditable institutions. To meet excess demands, coaching institutions have been established in almost every part of country, these institutions have received social support. A lack of effective mechanism to identify and discourage institutions that are offering coaching has created an environment for mushrooming of such institutions. The promotion of coaching institutions in education is justified on social, economic and cultural grounds. The inability of the Government, due mainly to financial constraints, to create and strengthen infrastructure for meeting the growing demand for quality education is mainly responsible for the increase of these commercial activities in education. The educational infrastructure- the schools, teachers and other learning support service- indicate deficiencies in facilities to attract and retain students for quality teaching and learning. A large number of students, therefore, do not enroll for basic education and those who do so, a majority of them drop out before completing even elementary education. . In countries like, India, which continue to have unequal distribution of income and wealth for different historical reasons, such as feudal character of the society, mixed economic systems, etc. are not enough, especially for realizing the Constitutional objective of establishing a socialistic pattern of society. The economic and administrative measures are not only inadequate but also prove to be counter productive due to democratic polity and influence of better-off sections in the political process. It is, therefore, considered desirable to use the instruments of education and training to empower the socially, politically and economically weaker sections of the society. The Constitution of India under Article 45 has stipulated for providing free education for all children up to 14 years of age by the state. The realization of this target has, however, remained elusive, mainly because of deficiency in school infrastructure and paucity of resources to cater to educational needs of eligible population groups. For historical reasons, education in India has been provided by the Government in partnership with private sector/ NGOs with a view to supplementing Government efforts for augmenting opportunities for teaching and learning. It is this approach of educational enterprise that encourages private initiatives. And, the developments in this area present a picture of light and shade. The contribution of private institutions is commendable in expanding schooling facilities as well as in providing quality education. School facilities are largely provided by the government- the centre, states and local bodies. A majority of students attend such schools; drop out before completing the secondary level. A major factor responsible for high dropout/failure rate is that the school environment is not conducive to teaching and learning due to such factors as teacher absenteeism, un-trained teacher, lack of classrooms and other teaching aids. As a result of these deficiencies, a large number of privately managed ‘teaching shops’ or tutorial schools have come into existence everywhere. These schools are run on commercial lines. A number of them assure high academic performance of students and adopt aggressive methods of publicity, which enable them to attract students from rich families who can pay high tuition fees and other school charges. There is, thus, rampant increase in commercial activities in education even at the level of education which the government is constitutionally obliged to provide. Most students, especially those who attend government schools terminate their education on completion of +2 stages. A majority of them, therefore, need vocational preparedness to enter the world of work. 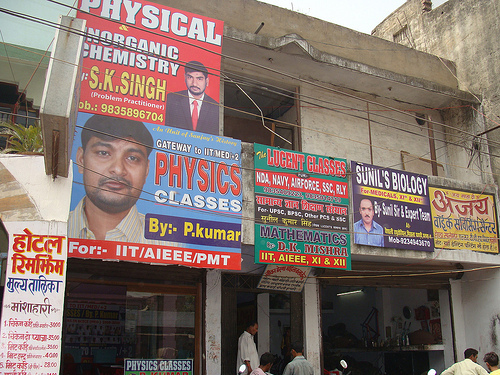 A large proportion of students, therefore, seek support of private institutions, which provide on commercial basis vocational training and offer job-oriented courses..
A large number of students, who do not join colleges/ universities as regular students, are allowed to appear as external/ non-collegiate students, degree level examinations. Many of them attend coaching centers, which charge high fees. correspondence course institutions have taken almost similar advantage. The Government’s failure to fulfill its mandatory obligations of making adequate provisions for quality education, commensurate with the requirements for quality teaching and learning, is chiefly responsible for encouraging commercial activities in education. As education is profitable, socially and economically, parents and their wards have little options. They are, therefore, easily exploited either by paying high un-economic costs of education or by foregoing quality education, which in any case create all forms of disparities. Now, we will discuss all those aspects which affect the attitude of the society to engage Private Tuition. Cut Throat Competition- The foremost reason of the tuition is competition, it starts since the birth of a child. The basic reason of competition is the expectations and scarcity. In the context of education, expectation of normal middle class parents starts child since the birth of child. Generally they decide the future of their child as a Doctor, Engineer, IAS, IPS, MBA, CA or a highly paid job. These expectations push a child in an endless race of competition. Slow Learner Student- God is not endowed with a sharp mind to every child. Every child is having a different capacity of learning. Some student can learn mathematics very fast. Some of them easily learn literature and social studies. Few of them can learn every subject very fast. In Indian condition school teacher has his limitations, he can not pay required attention on slow learner students because of high ratio of teacher and students. It is not possible for teachers to pay attention to all students and remove their difficulties individually. If they indulge in removing the difficulties of every student the course will not be completed in time. On the vice-versa student hesitate to ask the teacher in class room because of shame or in fear of being insulted. Although students are slow learner but they want to gain knowledge and their parents are capable to pay the private tuition fee. They take the help of private tuition. In this situation tuition is the only remedy for slow learner students. In nut shell, tuition is a boon for slow learner students. Some student’s are careless they are not attentive in the class room. They are weak in study. They are capable to bear the private tuition fee. Because of carelessness they are not serious about their studies and take private tuition or coaching. Brilliant students are considered the assets or pillar of a school. . They are very attentive in the class room and home study. Their grasping power is very high. But some time them because the liability in point of view classroom discipline. The reason of that they are not satisfied with average level class room teaching and want to get better knowledge so they prefer to get private tuition or coaching. They get sufficient knowledge as per their expectations and level from their tutor/ coaching centre. So, such students have no interest in school classes because they already have the knowledge, whatever is teaching in the classroom. They may play mischievous in class room and disturb other students. They study own and qualify every exam without taking any extra help. If they prefer tuition, they will prefer for the stake of satisfy their knowledge thirst. Limitation of Illiterate Parents- Illiterate parents pay a great role to promote the tuition in the society. Where parents are illiterate and they are not able to teach their wards but are well aware about the importance of education. . In this situation tuition is the boon and tutor is like an angel for them. Because after making little financial sacrifice they are able to get invaluable education by hiring a tutor for their children. Limitation of Professional/ Educated Parents- Not only the illiterate parents is able to teach their children but highly educated parents also. Some time educated parents are able to teach their children but changed and lengthy syllabus makes it difficult for them to teach, as, they are not aware of new contents. They can teach only what they have studied in their times. Percentage of women in business activities, professions or services is also increasing. It also helps to promote tuition. They think that it would be better to arrange private tuition and coaching for their children rather than spare time to teach their children. Because they can earn more whatever they will pay to tutor. Generally educated parents are able to teach their children very efficiently but they are too busy in their busy schedule. Due to the busy life schedule, the need of private tuitions is recognized as an essentiality. Lengthy Curriculum- In some cases, course of study is too wide and lengthy that it put pressure on the mind of a student. Beside this, excessive home work, unit test, monthly tests, three terms examinations over ruled the mind of the students . Ultimately this lengthy and wide curriculum invites the private tuition. Communication Gap between Teacher and Students- The basic essential of formal education is both side communication between teacher and students. When students are not able to understand what teacher wants to communicate due to any reason and they don’t give any feed back to their teacher or vice-versa teacher is not able to transfer required knowledge to them due to any reason in spite of getting the feedback from the students. This communication gap can be filled up by extra help. If this extra help is provided in exchange of financial consideration,in the shape of tuition. Higher Expectations of Parents -In the present social system generally parents planned their family by one or two babies. So that they can look after their family well. They ready to sacrifice all their resources on their children. When they contribute a big part of their family income on the children, their expectations become high towards the children. Keeping in view of the present social system, having the higher expectation from their children are not a sin. Because parents take the risk of having even one child so that they can look after him well and stand him to face the cut throat competition of life. Whenever they see themselves to lagging behind from their motive they take the help of tuition. Thus tuition can be considered as a tool in the hand of parents to fulfill their wishes. Indifferent Attitude of Teacher and Students- Indifferent attitude of teacher and students promote the tuition. Teachers teach in class room for the sake of teaching not as performing their duty on the other hand. Some teachers come to class room only for formality, just passing the time and mark their attendance. Similarly some students come to school either for completing their attendance or for entertainment. Sometimes the personality of teacher or his language and pronunciation may be reason of indifferent attitude of students. All these things promote the tuition in the society. Tuition can be seen as social habit in the society. Already Learned Subject Matter-Most of the students take the tuition; particularly students of class 10th and 12th of public school take the tuition since the beginning of academic session. They have already learnt whatever teacher is teaching in the class room or they think that they will learn the current topic in tuition. That is the reason, these students are not attentive in the class room and they play mischievous. When students do not show their interest, accordingly teachers develop their attitude towards teaching. Teachers are the part of this society, when they see tuition is taken as social habit in the society they lose the interest of teaching in the class room.. Few teachers were not take teaching sincearly because they know most of the students are taking tuition of their respective subject..
Extra- curricular Activities- Non formal way of education is the good and effective method of teaching. But excess is always harmful. For example the trend of giving the project after completing the every lesson is deviating the aim of giving the projects. These projects helpful in grasping deep knowledge about the lesson or subject and the students have to complete such projects in a limited time frame but they have to do the home work of other subjects. Such limitations of time make them to take the help of an expert available in the market. Some time the topic of the projects only available on the internet. What students will do if they do not have computer or internet at their home? So most of the students do not complete the projects (charts, models and diagrams) themselves. Either they take the help of parents or other persons or get it complete from the expert available in the market after paying the fee. This is another form of tuition. Nuclear Families- In these days our society has a trend of nuclear families. In joint families, per person income comes out very lass. Generally one or two members earned and others were eating. Share of family income very less per member. But in nuclear families share of family income very high. Every parent wants to give all those things to their children, what they were deprived to get in their time due to large size of family. It includes education also. In nuclear family, where size of family planned by parents by one or two children. They want to give the best education to their children. If they are not able to teach themselves their children, they easily hire a tutor. Socio-economic Status Symbol- Tuition has become a status symbol of our society like expensive gadgets, vehicles and branded garments. Parents, whose ward do not require tuition because they read in primary or below primary classes, hire a tutor just to show their status symbol in spite of that they are having enough ability and time to teach their wards. No Control on Coaching Institutions- There is no policy of government to restrict the coaching institutions. These institutions help to increase the habit of tuition. Coaching institutions impart the knowledge not only for academic courses but also prepare students for the admission test in professional institutions. Naturally they charge heavily for their services. Because they hire best faculty from all over the country. But this is a faulty system. It seems as these institutions are made for rich persons or to exploit the poor parentsThis system not only will give the necessary feed back to teacher but also encourage the students to attentive in the class room. It is require to overview all the education policy. Partial Attitude of the Teachers- School teachers has the partial attitude towards those students who are taking tuitions from them. They have more interaction with such type of students and pay them extra attention in the class room. Even their partial attitudes reflect when they evaluate the answer sheet of examination. Such types of attitude of teacher psychological encourage the students for taking tuition from them. Although it is a black spot on the profession of a teacher but it is true that some time who are not taking tuition because the victim of violence mentally of physically made by a teacher and to save themselves from this violence, students have no alternative except opting the tuition. Importance and Nature of Specific Subjects-Trend of tuition is seen in particular subjects like Maths, Science, Accountancy and English. Generally trend to English tuition is seen in Hindi speaking State or in Hindi medium schools. Faulty School Administration- Faulty school administration also promotes the tuition. Faulty administration may be the form of faulty time table or allotment of a class to in improper teacher. School administration should recognize those sections of students and area of the subjects which needs more time of teacher accordingly time table should be prepared. Beside this, administration should recognize the caliber of a teacher before giving the class in his hand. If above factors mismatch it will hamper the quality of education. If quality of education affects then it will promote tuition. • Number of schools are not increased. • Examination policy not revised . • No stoppage to indulge teacher in performing other duties like election or census duties. • Interference of politician and bureaucrats in education matters and policies,and decisions taken by those people who have no concern with education. • There is no ban for school teacher to give private tuition. The above was the one side of the coin and the other side is, that every one of us wants a better life and earns for that. To live the better life and earning for that is not a sin. In the present social system when parents opt planned family only one or two child. What is wrong if their expectations are very high. Every child is not endowed with a sharp mind or some other reasons he has to take the help of tuition. Tuition is a tool to make children perfect in education and help them to stand in a competitive life. It helps in making the dreams true of their parents. Indians, who had a chance to visit European countries and America, experienced that standard of our school education or you can say syllabus covered by our school is far-far better than Europe, America or Canada. Even America President Obama appealed the American students, “Americans either read Mathematics otherwise Indian will defeat you in the race of progress”. It means syllabus covered by our schools is good. Even up to some limit quality of education is also good. Only the thing is that such quality is gained 90% with the help of tuition and 10% from school education. Secondly, education is not extended in the weaker section of the society. It is limited up to middle class or lower middle class. The extent of socio-economic gains derived from education and the resource costs borne by stakeholders, namely the beneficiary students and service providers, widely differ for various levels and types of courses. The measurement of such benefit and costs are, however, fraught with many conceptual and measurement difficulties. The socio-economic benefits reaped by students over the entire span of working life are, therefore, accepted axiomatically. It is generally perceived that the cost of not acquiring new knowledge and skills are more than the cost of obtaining them. In fact, the costs of provision of educational services borne by private coaching institutions and students/parents, are, therefore, considered equal to or less than the expenditure incurred by the beneficiary students. The expected gains from education and training generate high demand for educational services like coaching institutions, which when not provided by the government or other philanthropic organizations, encourage private investors and entrepreneurs to offer various courses on self-financing basis.